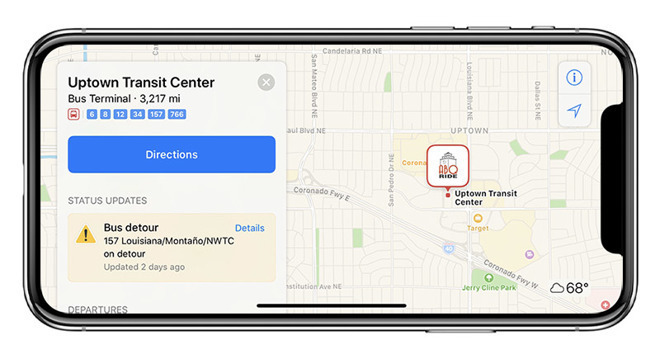 Apple could help people navigate an unfamiliar area with Apple Maps more naturally with an iPhone using an AR view of a map, with directions able to change based on the movements of the user. Standard map applications offer users a wealth of data about their surroundings, with the top-down 2D view advising of different routes and pathways a user could take, and their relation to each other. It is also possible to use some apps to see the maps in a 3D view, giving an impression of elevation for the environment, and when used with satellite imagery, a hint of the kind of views the users could see if they were in the same position, but in the real world. The problem with both 2D and 3D views is that they still rely on users navigating around the map by touching the screen or making gestures, such as pinch to zoom and to move the virtual camera around, which may be unintuitive to use when in the 3D view. Furthermore, the 3D view is limited in terms of the angles a user could set, something which could potentially be improved upon. 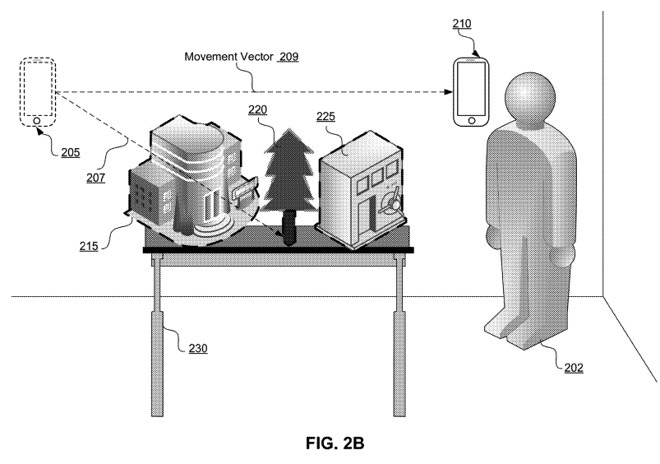 Published on Thursday by the U.S. Patent and Trademark Office, Apple's patent application for an "Augmented reality interface for interacting with displayed maps" describes how AR could be used to control the motion of the virtual camera in the 3D view mode. In this mode, the users would be able to move their mobile device to line up the direction of the virtual camera, including the angle of the camera, the direction, and even the height of the camera from the virtual ground. In effect, movements of the phone relate directly to changes in perspective for the app. The effect could be best described as users looking at a model village on a table through their iPhone's camera view. To accomplish this, the patent application describes a system similar to one already used for augmented reality applications, namely the use of a camera and onboard sensors to determine a starting position of a mobile device in a physical environment, using subsequent updates in position and imagery to determine changes in view, and to keep track of the relative position of virtual objects, like the map. Once a surface to place a 3D object has been detected, users can register the map's location in 3D space by pressing a button or some other input. The location is then used as the central point of the virtual map surface. Apple makes a large number of patent-related filings each week, and while they are an indication of where some of Apple's interests lie, the publication of filings are not a guarantee that the concepts described will be used in a future Apple product or service. In the case of an AR mapping application, there is a considerable level of plausibility for the function to be made available to users, even as an added option to Apple Maps. Apple has put extensive work into producing ARKit, the company's framework that helps developers add augmented reality elements to their apps, and has even produced its own AR apps, such as Measure. This is not the first time Apple has considered using AR to help users with navigation issues. In early December, a patent application suggested the use of AR for passengers of ride-hailing apps to find their driver, and vice versa. For its car-related projects, Apple has also proposed the use of an AR-like system to show the road ahead of a driver, even if it is obscured by the landscape or other road elements. Apple is not alone in exploring AR in maps. In May, Google teased how AR could be employed in its own Maps app, including navigational directions provided in a combined 2D and AR view, and a "Visual Positioning System" that would use AR-like features to determine the smartphone's exact location based on seeing nearby landmarks, potentially making it a more precise method than GPS in some cases.